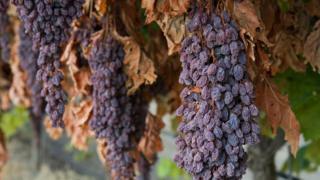 The UK has been hit by a global shortage of raisins, sultanas and currants. Britain - the world's biggest importer of dried fruit - has seen the price of raisins and sultanas rise by 42% since September, leading suppliers have said. They blame falling numbers of raisins in California for pushing up prices. Bakeries say increases are unlikely to affect the cost of hot cross buns - but an industry analyst warned this year's Christmas puddings could be hit. Jara Zicha, a market analyst in the UK, said farmers in California, which produces most of the raisins destined for the UK, have moved away from producing dried fruit in favour of more profitable crops. Mr Zicha, from the retail consultancy Mintec, said: "It's a gradual decline simply down to farmers moving to other crops because of rising labour and land costs." He said rising supply costs in the UK had been exacerbated by the fact Greece was also producing fewer currants. The US shortage has increased demand for Turkey's sultanas and raisins, he added. Fears were initially raised over the cost of Easter hot cross buns. However, several bakeries told the BBC the current shortage has come too late to affect hot cross bun costs this year. Several bakers said they already have large stocks of dried fruit and have agreed contracts with suppliers. Ruth Burke-Kennedy, from Yorkshire-based bakery and tea rooms Betty's, said: "We are covered through this season because our purchase prices are fixed, we can ride it out." Gordon Polson, director of the Federation of Bakers, said anybody who is making hot cross buns for Easter will "already have the supplies in place". Steve Dresser, founder of retail consultancy Grocery Insight, added: "I would be surprised if any shortage impacts the price of this year's products given the fruit will be bought and either in depots or on the way over, given the uplifts of sales nearer Easter." Andrew Ciclitira, director of UK dried fruit supplier Demos, urged manufacturers to be "more creative" and look to Australia and South Africa as alternative suppliers of raisins and sultanas. Mr Zicha warned the current shortage could have an effect later in the year - potentially at Christmas. "Most of the bakers have the stocks already," he said. "But this shortage, rather than affecting Easter, might affect products at Christmas time, like Christmas pudding." Barney Desmazery, BBC Good Food editor, urged budding bakers to get creative with their choice of ingredients. "The history of cooking has been a shortage of one ingredient and using another," he said. "There's no reason we should not have our Christmas cake, but maybe using dried mango, coconut and rum instead."